You must have seen or heard of the Queen of Nile, Cleopatra! Discover more about her on Cleopatra Plus Slot at Wicked Jackpots. It is powered by IGT and consists of 5 reels and 40 paylines. Cleopatra, who was known for her multiple love affairs and her good relations with the Romans, became the Queen of Ancient Egypt. She was also famous for her incomparable intelligence and beauty. The backdrop of Cleopatra Plus Slot offers a glimpse of Ancient Egypt with Pyramids in the distance. Its reels are full of symbols like Horus, Ra, Aset, Anubis, Osiris, A, K, Q, J, 9 and 10. Enjoy a superb game under Cleopatra’s mesmerising gaze on any type of device at Wicked Jackpots! While you are still under Cleopatra’s spell, begin your gameplay on Cleopatra Plus Slot! Make use of the + and – signs on the Line Bet field to adjust your stake. The Spin button activates the reels. Enjoy the Auto Play feature which lets you activate up to 50 spins that are played without your intervention. Meanwhile, plunge into the stunning graphics and relax! Bet Levels: Levels are not present on Cleopatra Plus Slot. Coin Values: The various coin denominators range from £0.40 to £800.00. While you enjoy Cleopatra’s graceful presence, take a look at the special features of Cleopatra Plus Slot! For example, the Wild icon appears on all reels in stacks of up to 10. It also substitutes for all symbols, except Scatter to form winning combos. Watch out for the Followers symbol! It acts as the Scatter on Cleopatra Plus Slot. You are provided with the deity who is responsible for collecting Followers using an icon found in the top left-hand corner. The selected one then appears more frequently. Three or more Followers on the reels trigger 5 free spins. Place several Followers on the map as determined by the icons. 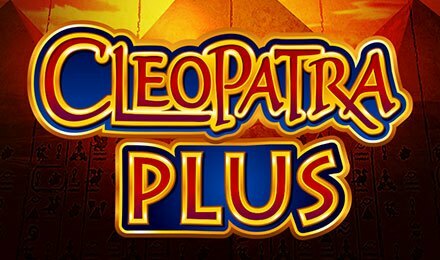 More fun awaits on Cleopatra Plus Slot with its Level Up Plus Feature! Start by picking a location among Nile River Valley, Pyramids of Giza or Alexandria. When you reach levels 7-8, the Pyramids of Giza becomes active. One to three Followers appear only on reel 5 and the bonus game begins with 3 to 7 Followers. Move to each location on the map to earn various rewards such as 10 spins, 30 Free Spins, 5x, 30x or 50x your total wager. Beautiful Desire of Aset: Unlock 3 new deities with 200 to 349 Followers. The selected one is then stacked. Chosen by Aset: The level starts with 0 to 49 Followers on the Alexandria map. Heart of Aset: The Nile River Valley map is activated with 50 to 119 Followers. Aset Is Pleased: It activates an extra scatter on reel 5 with 120 to 199 Followers. Plus, one more is added on the map. Eternal Strength of Aset: Earn an additional scatter and 2 more Followers that are unblocked with 350 to 599 Followers. Everlasting Light of Aset: The last spin multiplier on the map is unblocked, while a larger prize of 601 to 899 Followers are awarded. Golden Face of Aset: The level triggers the Pyramids of Giza map with 900 to 1249 Followers. Glorious Soul of Aset: Here, the Super Spin feature is unlocked on the map. Discover Cleopatra’s grace on Cleopatra Plus Slot at Wicked Jackpots and be ready for hours of entertainment. All the best to you!